A standard zoom lens is the one lens that almost all photographers will have in their bag. This makes it a very interesting area for the manufacturers, as there is a potentially huge market for the lenses. Equally, since we no longer receive 35mm or 50mm prime lenses as a kit lens with cameras, the standard focal length zoom lens is an ideal replacement. By offering an L-Series lens with the EOS 6D, Canon is clearly hoping to indoctrinate new users in the benefits of the L-series over lesser quality lenses. Along with the red L-series band around the front of the lens, the EF 24-70mm f/4L IS USM benefits from Canon’s mature Image Stabilizer technology, including a hybrid facility to works not just in normal shooting, where it offers 4-stops of IS, but also in macro shooting, where it provides up to 2.5stops of IS. There is also the inclusion of the well-respected UltraSonic Motor (USM) AF motor for fast, quiet autofocus. Whether it is more than the sum of its parts or not, though, will only be shown by the test results. The overall DxOMark score of 19 shows this is not one of the best lenses tested, but there are some areas where it is remarkably good for a zoom lens. Taking the overall DxOMark score of 19, we can see that the lens is not an especially high performer in terms of overall image quality. However, looking at the scores in detail, we can see where the lens fall down. Starting with the sharpness score, a rating of 13P-Mpix when attached to an EOS 5D Mark II is not that high when the nominal rating of the camera is 21P-Mpix. However, to put this into context, it is expected that zoom lenses will score lower than prime lenses due to the increased complexity in manufacture and the extra compromises required in lens design. Even the high scoring Canon EF70-200mm f/2.8L II IS USM lens only managed a sharpness score of 18P-Mpix when attached to an EOS-1Ds Mark III, a camera with a very similar nominal resolution. Although the score itself is not that high, the main issue with the sharpness is the lack of homogeneity cross the frame. At all focal lengths when shooting at the maximum aperture, there is a fall off of sharpness across the frame. This is most noticeable around the 50mm focal length. Closing the aperture down to f/5.6 helps to alleviate the problems, but there is still a fall off. By f/8, the sharpness is close enough to even across the frame to not be a concern. Even so, the 50mm focal length setting is still the one that offers the lowest score. At 24mm and f/4, there is clearly some sharpness lost in the corners of the image. At 50mm and f/4, the sharpness scores across the frame is very poor, showing a rapid fall-off from the centre to the edge of the lens. The transmission score, on the other hand, shows that the maximum aperture of the lens (f4) matches identically with the real life test results. Although a score of 4TStop seems low compared to a prime lens like an EF50mm f/1.2, a score of 4 for a zoom lens is very good showing there is essentially no light lost as it passes through the lens. Like the transmission score, the distortion score of 0.2% is especially good for a zoom lens, with only the slightest barrel distortion at the wide end of the focal range and an almost completely neutral result at the 70mm end. The vignetting score is one area that has impacted the overall DxOMark score. Only at 70mm and at aperture of f/8 is there almost no vignetting. At all other settings, there is some corner shading or light loss at the edges of the frame. At 24mm and f/4, the score of -1.3EV is too strong for a lens in this class. Finally, the chromatic aberration score of 8µm is actually very good. A score of 5µm is considered noticeable, but would only equate to around 1pixel on most cameras – certainly nothing that would be distracting in a final print. Beyond the tested metrics, both the USM AF motor and the advanced Hybrid Image Stabilizer are two plus points in favor of this lens. The IS system is a hybrid unit, first seen on Canon’s EF100mm f/2.8L IS USM Macro lens. The benefit of this is that whether you are shooting very close up to your subjects in a macro fashion, or whether you subject is more distant, the IS will function effectively to reduce camera shake while hand-holding. The standard zoom focal range is one of the most popular areas for lens development, so the fact that Canon now have three L-series models is no real surprise. Their overall DxOMark performance shows that in this case, price is quite a good indicator. The EF24-70mm f/2.8L USM is far an away the best of the three, scoring 25, with the EF24-70mm f/4L IS UMS and EF24-105mm f/4L IS USM only separated by a single point scoring 19 and 18 respectively. In the sharpness scores, the results are the same, the EF24-70mm f/2.8L USM is clearly the superior lens again followed by the f/4 version and very closely behind that, the 24-105mm. In the sharpness test, price is a good indicator of both overall sharpness and optical performance across the frame, with the most expensive lens, the EF24-70mm f/4L IS USM, taking top honors. Interestingly, in both the transmission test and the distortion test, the EF24-70mm f/4L IS USM outperformed the other two models. In the case of transmission, this is relative result to its stated maximum aperture, but for distortion, it is an absolute result. In vignetting, both the EF24-70mm f/4L IS USM and EF24-105mm f/4L IS USM lenses score a rather poor -1.3EV, but the more expensive f/2.8 model is even worse, surprisingly only scoring -1.7EV. The chromatic aberration comparison is also interesting, with once again the most expensive lens coming at the bottom of the pile, while the EF24-105mm f/4L IS USM comes out on top with a score of 6µm. Looking outside the Canon stable, the Sigma 24-70mm f/2.8 IF EX DG HSM Canon mount lens is very worthwhile contender, out-scoring the EF24-70mm f/4L IS USM lens in sharpness and transmission, and being very close in the distortion tests too. It’s only really the vignetting and chromatic aberration tests where this lens falls down (a score of 29µm for chromatic aberration is really quite poor), but the price is substantially lower than the Canon model, which may help you overlook its shortcomings. If the price of the f/2.8 version is a barrier, then this new f/4 model, despite its failings in some areas, is actually a good alternative, especially since it adds the benefits of the Image Stabilizer. 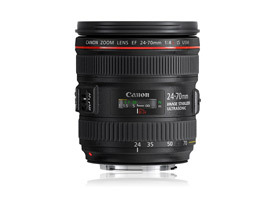 However, the long-running EF24-105mm f/4L IS USM lens is also worthy of consideration. The extra focal range from 70mm to 105mm may well prove useful, even if you own a 70-200mm lens, having some overlap means you do not have to switch lens quite so frequently. If budget really is a concern, then it is also worth looking further down the Canon range. Even then often forgotten EF28-105mm f/3.5-4.5USM lens manages a DxOMark score of 17, but for substantially less money because of the lack of an IS motor and the variable aperture.